Swiss Chard Sunset Selectie is an organically grown Swiss Chard variety. It has large, wrinkled, green leaves and yellow-orange stems. This easy to grow and very fast growing variety is mainly grown for it's flavourful leaves. But you can eat the stems too. Swiss Chard is also known as silver beet, beet spinach or leaf beet. It can be harvested after approx. 60 till 90 days after sowing. 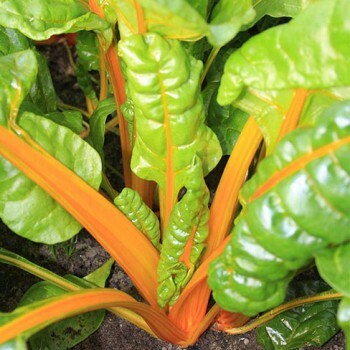 Swiss Chard is very healthy and versatile. You can cook, stir-fry, stew, steam, cook in the oven or shortly cooked the leaves of Swiss Chard like the leaves of spinach. You can also finely chop the leaves and use them raw in salads. Use the leaves of Swiss Chard in soups and mashed potato stews. The flavour of Swiss Chard is very much the same as the flavour of spinach. Combine Swiss Chard with cheese, eggs, potatoes, chicken, beef, minced meat, cumin, curry and with sweeter vegetables like carrots, courgettes, tomatoes, leek and peas. The veins can be cooked like asparagus or cooked together with the leaves, but the veins requirer a longer cooking time. Hardy annual. Swiss Chard has a good resistance against cold. You can sow outdoors from the middle of March. The seeds of Swiss Chard sit together in a seedcluster. Sow in rows approx. 45 - 60 cm apart. Cover the seeds with a layer of soil of about 1 cm. You can sow the seeds close together to prevent weeds from suffocating the seedlings. Thin to the strongest seedling per spot, when the seedlings emerge. These thinned seedlings can be eaten like a salad. Keep the soil moist during germination. Keep weedfree. Thin the seedlings to 20 - 30 cm apart, when they're approx. 7 - 10 cm tall. Eat this thinned seedlings like a salad. Provide the plants with extra blood meal to stimulate leave growth. Give the plants enough water and don't let them dry out. Swiss Chard grows better with temperatures below 24 °C. Snails and slugs can be a threat to these plants. You can harvest from May on. The plants are then approx. 20 cm tall. Harvest the outer leaves first with a knife. To ensure that the rest of the plant can grow on for a new harvest later on. Eat Swiss Chard fresh because it doesn't keep well. The leaves can be cooked or steamed like spinach. Some varieties are grown for there leaf veins. These can be eaten like asparagus covered in cheese sauce.